Emily Osment Gets Her Swag At Kari Feinstein’s Pre-Golden Globes Style Lounge — Pics Here!! Young & Hungry star Emily Osment shows off some of the goodies that she picked up as she attended the Kari Feinstein’s Pre-Golden Globes Style Lounge on Jan 9th. Check out more pics of Emily below at the style lounge. On November 7th, Emily Osment took to her Twitter page to share the first photo from her upcoming movie Love Is All You Need. The film which will star Emily Osment and Briana Evigan, is an indie drama which takes place in a world where being gay is the norm, and straight people are bullied. It sounds like a very unique and interesting plot! We can’t wait to see Emily work her movie magic in Love Is All Your Need soon! Emily Osment Attends A Katy Perry Concert In LA! – Pics Here! Emily Osment had an eventful night out on September 19th as she attended Katy Perry’s concert at the Staples Center in Los Angeles, California. Emily rocked a stripped navy blue and white dress with white knee-high socks, which she tells us actress Denise Richards loved! Emily enjoyed the show and had a great time hanging at the Dell area there with friends. Check out more of Emily at the concert below! Emily Osment Attends Glamorama “Fashion Rocks” Event In LA! – Pics Here! Emily Osment was a true fashionista as she attended the Macy’s Passport Glamorama “Fashion Rocks” event at Create Nightclub in Hollywood, California last night. Bella posed on the red carpet and showed off her pretty fashion, posed with friends, and more! Check out Emily looking stunning for the camera in these photos below! What do you think of her style? Would you rock this look? 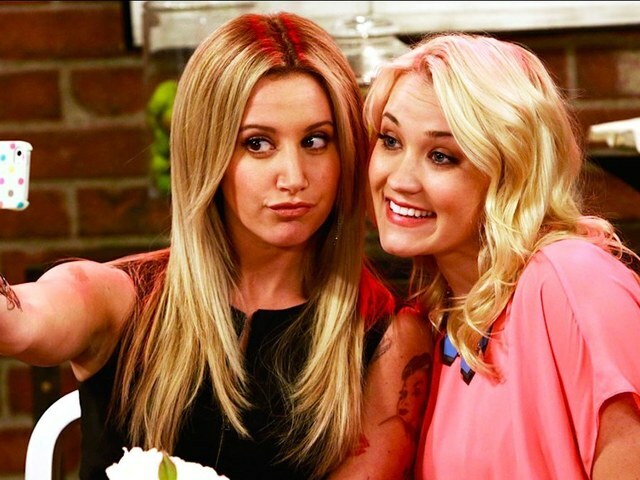 Ashley Tisdale & Emily Osment Interviewed By ‘The List!’ – Watch Here! The stars of ABC Family’s new hit show “Young & Hungry,” Ashley Tisdale and Emily Osment, were recently interviewed by ‘The List.’ The girls, as well as co-stars Ryan Paevey & Kirsten Storms, chatted about who you should be following on social media, which cast members are surprisingly geeky, who’s the biggest laugh-riot, and more! Check out the Y&H cast’s interviews HERE and be sure to tune in to “Young & Hungry” for more great talent and laughs! It’s The Big Wedding Day On The Summer Finale Of ‘Young & Hungry’– See The Previews!! YOUNG & HUNGRY – “Young & Thirty (and Getting Married)” – Josh and Caroline’s wedding is unexpectedly moved up and everyone is freaking out for very different reasons in the summer finale episode of ABC Family’s original comedy “Young & Hungry,” airing on Wednesday, August 27th at 8:00 p.m. ET/PT. Yolanda’s Son Has Eyes For Gabi On All New ‘Young & Hungry’ — Previews Here!! YOUNG & HUNGRY – “Young Getting Played” – Yolanda is thrilled when her son Derek comes home from school but is shocked when he seems to fall for Gabi, in a new episode of ABC Family’s original comedy “Young & Hungry,” airing on Wednesday, August 20th at 8:00 p.m. ET/PT. Debby Ryan, Lucy Hale, Emily Osment & More React To Viral Vids! Nothing makes us laugh harder than funny viral videos, except for maybe seeing celebs react to viral videos! Check out some of your favorite stars including Debby Ryan, Lucy Hale, Emily Osment, Nick Cannon, James Van Der Beek, and more as they react to some of the craziest videos on the net! What is your favorite viral video? Let us know in the comments below, and enjoy the laughter! Gabi Loses Her Car On All New ‘Young & Hungry’– Previews Here!! YOUNG & HUNGRY – “Young & Car-Less” – Josh accidentally angers Gabi while trying to do a good deed in a new episode of ABC Family’s original comedy “Young Hungry,” airing on Wednesday, August 13th at 8:00 p.m. ET/PT. In the episode, “Young & Car-Less,” when Gabi’s beloved car breaks down again, Josh sees it as an opportunity for her to drive something safer and takes it upon himself to replace the ancient vehicle. But Gabi is devastated at his gesture and reveals her car was the last gift she ever received from her late mother, leaving Josh horrified and the whole gang determined to get Gabi’s car back. Meanwhile, Yolanda and Elliot call Josh out on the fact that he treats Gabi differently than them.